Our Price $59.90 Another currency? When your PC goes rogue, having this hefty volume at your elbow is the next best thing to having a personal PC genie. 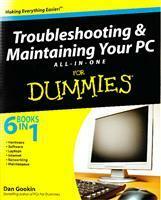 Dan Gookin wrote the original For Dummies book, DOS For Dummies. His books have more than 11 million copies in print and have been translated into 32 languages.